Since HANA DB (Database) that will be activated based on the DB memory I’ll go deal more detail about the memory here. It is how to configure the memory to use the HANA of memory actually in memory and HANA DB used by the hardware (H / W) and to describe the relationship of the actual physical memory ( Physical Memory = Real Memory ) and memory used in HANA DB I would like to understand more easily explained. HANA Used Memory refers to memory in the silse HANA use. The fact that HANA uses memory refers to the Used Memory. Memory Pool is the concept of using the features of SAP products in SAP ERP products. If the product is SAP Start ( Start) by default as part of free memory in advance to schedule and start (Start) to Paul memory space that reserved advance it (Memory Pool). Code and Stack is a program Coding region of the engine running area HANA. This area is a memory area used to be nice enough to also insignificant enough to ignore about 6GB. DB is a user with System Tables System tables that manage their own HANA DB is a user that is in the SYS, SYSTEM. Row Tables is a unit of HANA uses a lot of Colume Table with Row ( column) units used by the HANA table , but if necessary also included in the table Row row unit memory area is occupied tables in . 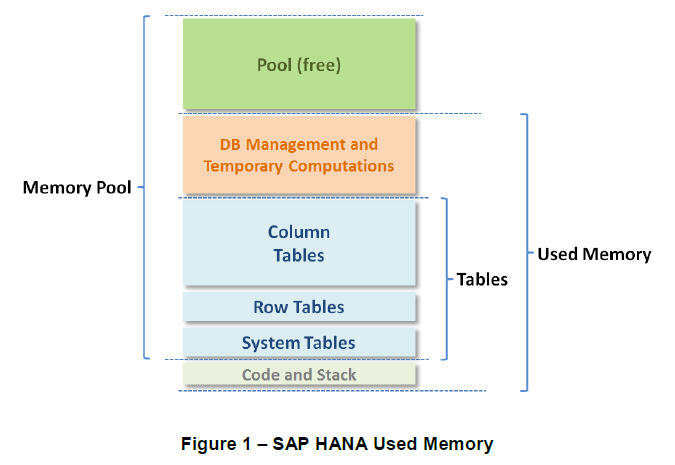 Column Tables are tables that account for most of the table that HANA is most widely used and also the most widely used memory . POOL (fee) region will use the POOL area where you need to free up memory after Iran POOL temporarily because it starts with the first memory when HANA was first started ( driving). Here I will explain it to the HANA Virtual Memory. The confusion created in the SAP inde information is believed to made to take the difference of Virtual Memory and Virtual Memory HANA ‘s OS. This picture make sure you understand the confusion devised HANA Virtual Memory Rarotonga representation. Virtual Memory talking on the OS (Linux) Paging Area is the sum of the physical memory (Physical Memory) and Disk. But SAP has created cause confusion, holding out a term called HANA Virtual Memory. 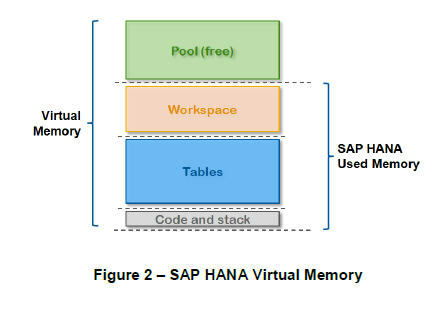 The HANA Virtual Memory is Used Memory + POOL (free) referred to in the HANA SAP. Here we will look at the picture below to explain in more detail HANA Virtual Memory . HANA Virtual Memory = Resident Memory. So the OS Virtual Memory = Physical Memory + Paging Area on Disk. Still confused and will not understand. I will move on this without knowing more , but the relationship is important in memory HANA jipgo looked clearer . Here we will describe the relationship between the respective physical memory ( Physical Memroy ) , virtual memory ( Virtual Memroy ) , the memory being used ( Used Memory ) . The memory of the dictionary meanings defined in speaking SAP. Here we will describe the size relationship between the memory . So it’s a little complicated to define the memory and connecting . It is here we need to know I’m covered important memory allocated (Allocated Memroy). We allocated memory where the H / W vendors (IBM, HP) there is to buy a PC on if you think that plugging a 10GB memory here PC we have not used up 10GB of pc When installing Window xp here not only it does not use 2GB . This Windows XP, the failure to use this amount to a maximum of 2GB of memory used only by plugging the PC to use a 10GB memory but will not be able to recognize only the 2GB OS (Windows XP). This is called the memory we allocated (Allocated Memory). Physical memory> virtual memory is Physical memory (Physical Memory) is installed in the OS is larger than HANA Virtual Memory. Here we have an OS Virtual Memory of the physical memory (Physical Memory) + seuwop area (Paging Area on Disk). So the following calculation will be established. I have a representation to the allocated memory (Allocated Memory) = Shared memory + allocated Heap Memory. 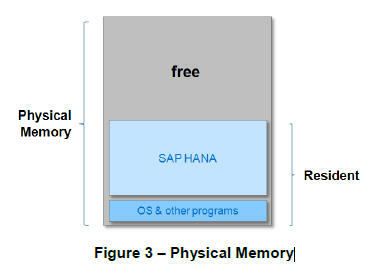 Shared memory (Shared Memroy) and proprietary Memory (Heap Memroy) from the memory structure of SAP ERP and the description is applied in HANA. Allocated Memory is a memory limit can be used as a parameter, Global Allocated_limited of HANA. Finally, we will organize the final of each memory. A physical memory ( Physical Memory ) is a hardware (H / W) equipped with a physical memory. HANA virtual memory (Virtual Memory) is the memory and the memory used by the Code & Stack to use the HANA DB. Memory (Used Memory) is memory that is actually being used is using HANA. The memory allocated (Allocated Memory) is memory that is allocated to limit how much they will use the HANA. Below is the description of the memory content frequently appeared on HANA. This figure is a little difficult to understand details . Here we will now describe in detail the relationship of the memory used . Here ‘s an unusual problem in memory management rirukseu (Liunx) will explain this part. In this figure, we will explain from the Physical Memory in the Top . Physical Memory is physically refers to a memory provided in the hardware (H / W) of the server . Allocation Limit is the amount of memory to allocate the total amount HANA DB. Virtual Memory is a Code, Row / Column Table, Temporary operations , Pool ( pre- allocated memory space). Resident Memory Virtual Memory is the same as the space that use memory -resident HANA DB space on a Linux perspective. Used Memory is actually a space in HANA uses memory . In this figure, I’m content to emphasize and explain the differences between Linux and memory management HANA DB. HANA will include the Virtual Memory Pool area subject to pre-allocate the memory when it is started, the HANA (not the Virtual Memory of the OS). The Pool area is when performing calculations or as temporary (Temporary computation), to delete the table space used by Used to delete the zone and returns the memory to the Pool area. And if again you will need to use the Memory Pool area again (Used). So , you can use Virtual Memory to memory Allocation Limit. Used memory deuryeotneundeyo described as a memory area , which is actually used HANA . The use of the memory will be heard on HANA reduce the memory was increased in real time. However, when you view the memory on the Linux OS ‘m sure a memory -resident (Resident Memory) memory is the same as the Virtual Memory On HANA. Here is a problem I’d occurred. This entry was posted in HANA DB. Bookmark the permalink. 정리가 잘되있어서 한눈에 보기가 정말 편했습니다. 도움이 되었나니 저 또한 감사합니다. Hurrah, that’s what I was looking for, what a material! present here at this weblog, thanks admin of this site. SAP HAHA 도입을 검토하고 있습니다. 제가 본 SAP 관련 컨텐츠 중 가장 훌륭한 것 같습니다.